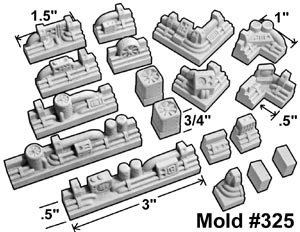 Click here for instructions on using the Station Builder Mold. 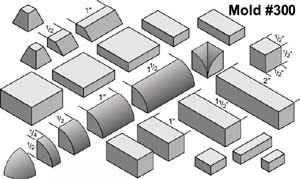 Will make blocks that can be used to build futuristic power and industrial stations. Can also be used to make bunkers. 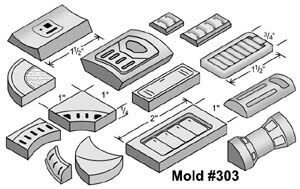 Click here for instructions on using the Starship Wall Mold. 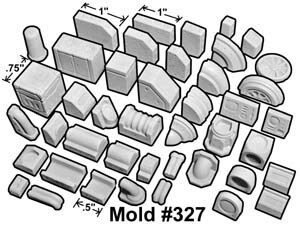 Will make blocks that can be used for clean looking starship walls. 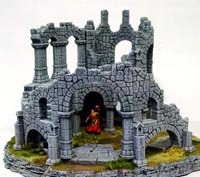 Includes a door with a small window and curved blocks that make a 2" outside diameter wall corner. 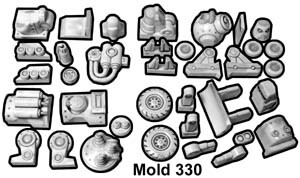 These accessories can be used with mold #301 to make cargo bays. 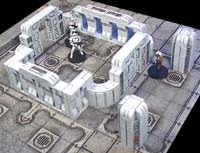 Includes barrel, crates, steel door, door frame and wall panels. 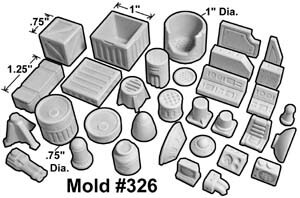 These accessories can be used with mold #301 to make a med lab and barracks. 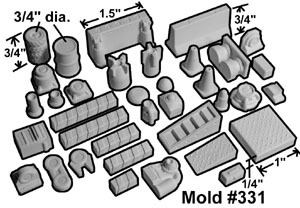 Includes 3" O.D. 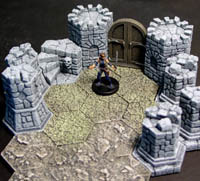 wall blocks and floor tile ring, 2" diameter iris door and base, bed, cryo container and locker block. 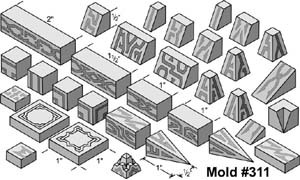 Click here for instructions on using the Skematic Pyramid Mold. 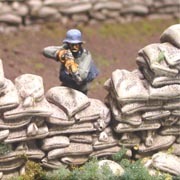 Sized for 6mm or 1:285 scaled fortresses. 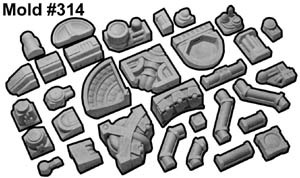 Meant to be combined with molds 313 and 314 to create futuristic structures for Battletech, Mechwarrior, CAV and other giant mech games. 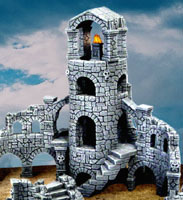 Sized for 6mm or 1:285 scaled fortresses. 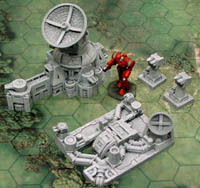 Meant to be combined with molds 312 and 314 to create futuristic structures for Battletech, Mechwarrior, CAV and other giant mech games. 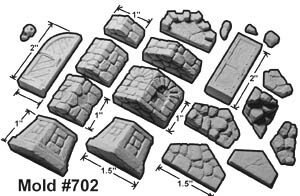 Sized for 6mm or 1:285 scaled fortresses. 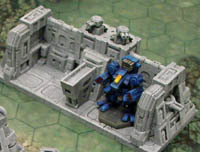 Meant to be combined with molds 312 and 313 to create futuristic structures for Battletech, Mechwarrior, CAV and other giant mech games. 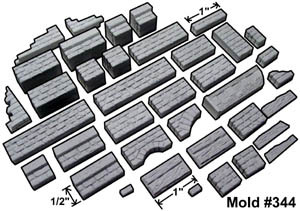 Meant to be combined with mold #415 to make posts for futuristic city walls and spaceship hallways. Used to make large 5/8" diameter pipes with 3/4" diameter flanges. 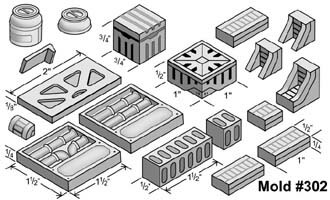 Includes several pipe lengths, ells, spacer blocks, a tee and valve assembly. 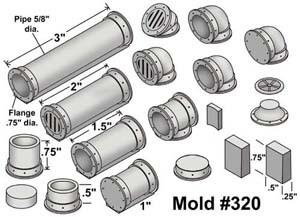 Used to make 3/8" diameter pipes with 1/2" diameter flanges. 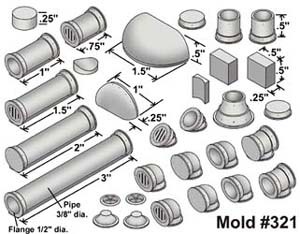 Includes several pipe lengths, tank tops, ells, spacer blocks, a tee, valve assembly and 2 adapters to fit the larger pipe mold #320. 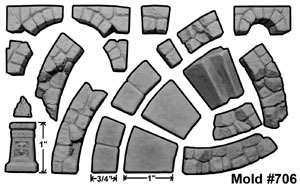 Used to make a 1/2" wide decorative border that fits around 1" or 1.5" modern floor tiles. 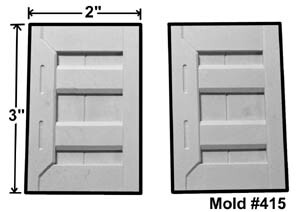 Includes 3", 2", 1.5", 1" and .5" lengths along with inside and outside corners. 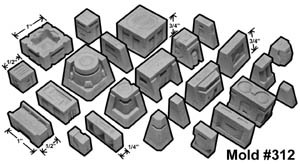 Pieces are 3/4" tall. 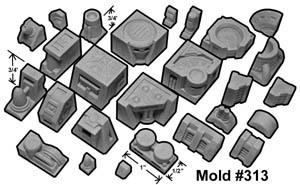 Used to make accessories for modern or sci-fi settings. 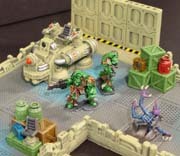 Includes 2 crates, a barrel, cryo tube half, chair, consoles, radar dish, gun, tripod, and missile pieces. 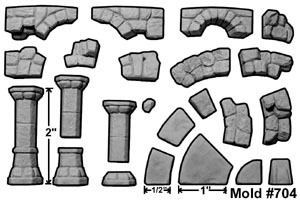 Used to make various building bits for large pieces of modern or sci-fi machinery. 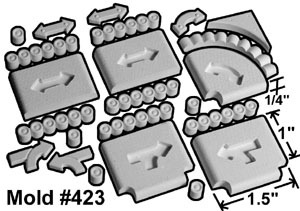 Used to make Nail bot, Roller bot, Carrier bot and Saw bot. 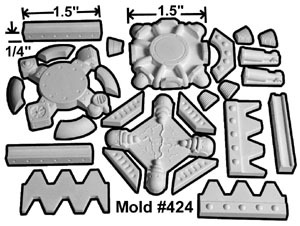 One casting of this mold will make all four robots. 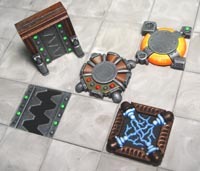 Used to make Security bot, Miner bot, Furnace bot and Jackhammer bot. 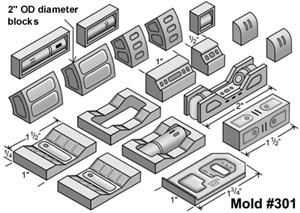 One casting of this mold will make all four robots. Used to make Hazmat bot, Electro bot, Lifter bot and Smash bot. 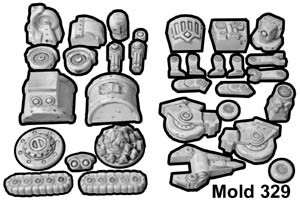 One casting of this mold will make all four robots. 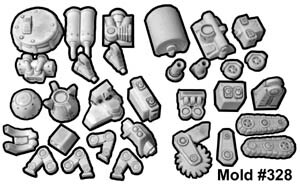 This mold includes a laser, missiles, oil barrel, tool box, robotic arm, jersey barrier, cones, ramp, hydraulic pushers and other bits. 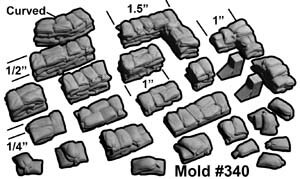 This mold includes 28mm sandbags. 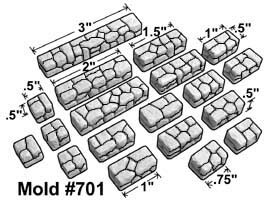 Stacks are 1/2" tall, 1/4"tall and interlock slightly on the ends. 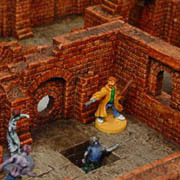 Includes a 3" dia. 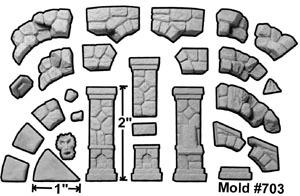 curved stack, two support posts, bag plank and loose bags. 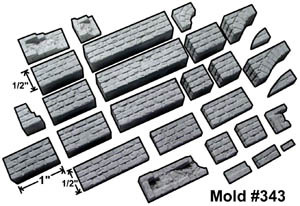 This mold includes worn brick and recessed arches for underground structures such as cellars, prisons and sewers. 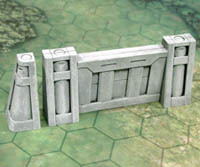 Meant to be combined with mold #315 to make walls for futuristic cities and spaceship hallways. 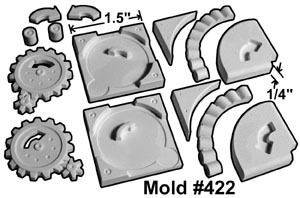 This mold will make 1.5" square plain conveyor belt pieces and a turning gear platform. 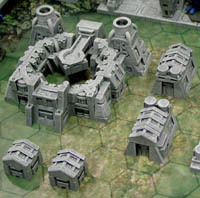 The rollers glue onto the sides after painting. 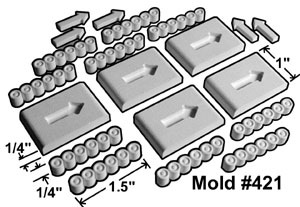 This mold will make 1.5" square conveyor belt pieces with straight arrows. 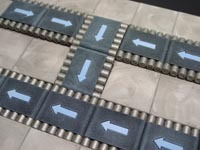 The rollers and arrows glue on after painting. 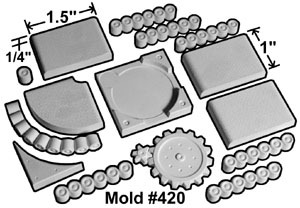 This mold will make 1.5" square turning conveyors and gear platforms. 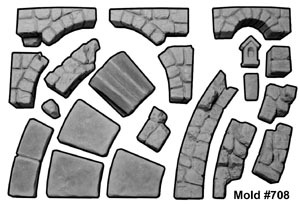 The rollers and arrows glue on after painting. 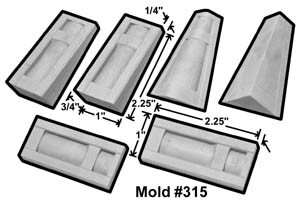 This mold will make 1.5" double arrow and merger conveyors. 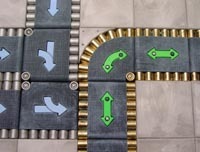 The rollers and arrows glue on after painting. 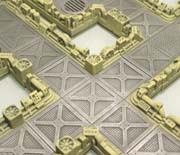 This mold will make 1.5" a telporter, shock plate, magnetic plate and steel trap door. 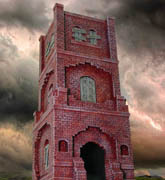 The decorative bits glue on after painting.